The Children Emancipation Society (Project Mala Schools) conducted 6 sessions this year : 5 in Mirzapur and 1 in Varanasi. Here are some of the initial photos we've received from their sessions. Thank you Project Mala for spreading the joy of stories. In its fifth edition of the 'One Day - One Story' campaign, Pratham Books was joined by 3000+ storytellers who conducted 3200+ storytelling sessions. Many, many steps towards a 'Reading India'! What started as a small step by Pratham Books to spread the joy of reading has become a movement. In 2012, Pratham Books initiated the One Day-One Story initiative on the occasion of International Literacy Day . 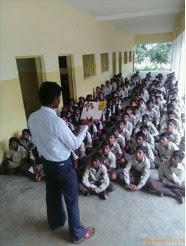 We will be sharing the stories of all our volunteer storytellers (Pratham Books Champions) through our blog. View more stories from the International Literacy Day Celebrations held in 2016.